We’d love your help. Let us know what’s wrong with this preview of Escape Velocity by Robin Stevenson. To ask other readers questions about Escape Velocity, please sign up. Lou is fifteen and is basically in charge of taking care of her father who hurt his back in a work accident. Many times it is hard to tell who the real adult is. Due to unforeseen circumstances with her father's health, Lou must suddenly uproot and stay with her mother who abandoned her as a baby and she has little contact with. She only knows that she basically cramps her mother's style and can't wait to go back to her dad's. Then a mysterious woman appears at her mother's book reading and Lou Lou is fifteen and is basically in charge of taking care of her father who hurt his back in a work accident. Many times it is hard to tell who the real adult is. Due to unforeseen circumstances with her father's health, Lou must suddenly uproot and stay with her mother who abandoned her as a baby and she has little contact with. She only knows that she basically cramps her mother's style and can't wait to go back to her dad's. Then a mysterious woman appears at her mother's book reading and Lou starts to wonder how this odd woman could be connected to them. But she finds much more than just a simple answer, she finds her and her mother's past. It may be the one thing that can unite them. Stevenson's work here is difficult to describe. You are drawn into the character of Lou who only feels that she really doesn't belong anywhere. But then she starts to realize there must be something more than the every day monotony she calls her life. How many other people seems to just be content with 'getting by'? The frame work of this book is beautifully laid out that each action seems to emphasis the growing relationship and mutual respect which begins to evolve between Lou and her mother, Zoe. I love the idea of simply implanting an anonymous, and odd person to trigger questions which never would have arose as the moved through their time together. The book covers developing mother/daughter relationships as well as reaching out for friendship. It also leaves the reader feeling connected and invested in the future of the characters. Even upon finishing the book, I felt I wanted to know how their lives progressed. The book also covers coming of age issues, and self discovery as well as acceptance. We can't always be the perfect person, or have the perfect parents, but we can learn what we can when we can and move on from there. Well done. 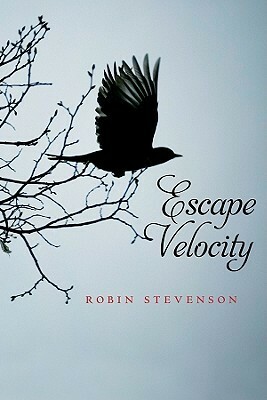 ‘Escape Velocity’ by Robin Stevenson is a teen book about Lou, a girl who, after her father falls ill, must move in with her estranged mother. Her mother abandoned Lou when she was just a baby. Lou is incredibly nervous about having to stay with a woman she hardly knows, but hopes the opportunity will allow her to connect with or learn more about her mother. There was very little, technically, wrong with the book. The writing was strong and clear. The storyline was quite well thought out, and ev ‘Escape Velocity’ by Robin Stevenson is a teen book about Lou, a girl who, after her father falls ill, must move in with her estranged mother. Her mother abandoned Lou when she was just a baby. Lou is incredibly nervous about having to stay with a woman she hardly knows, but hopes the opportunity will allow her to connect with or learn more about her mother. There was very little, technically, wrong with the book. The writing was strong and clear. The storyline was quite well thought out, and everything was paced just right. I never felt either rushed or bored. The plot was interesting, and I was definitely entertained the entire time I was reading. I found that most of the characters were pretty well fleshed‐out as well. The notable exception to the nice characterization was the main character, Lou. I felt like I didn’t really know her, aside from obvious things, and therefore never felt really connected to her. She’s upset and confused about her mom, who abandoned her, and worried about her dad, who’s sick. These are rather obvious feelings, nothing surprising. As for more personal feelings, her moods kind of flip throughout the book. At first she seems really happy with her father, then she starts listing a bunch of things that are not just semi‐wrong, but really uncomfortable. She seems to want to befriend Justine, but no heartfelt or honest connection is ever made there. She can’t stand that her mother abandoned her, but wonders why her mother doesn’t feel warm and fuzzy, in return, toward her own mother. Lou is a teenager living in Alberta with her father, and she's miserable. She has no life, no friends, and her father's deteriorating health and prescription drug addictions are driving her mad. Her mother, a famous poet and author, left minutes after she was born. They reconnected when she was a older, but things have happened since that makes it difficult for them to speak to each other. When the unthinkable happens and Lou's dad ends up in the hospital after a stroke, she is shipped off to li Lou is a teenager living in Alberta with her father, and she's miserable. She has no life, no friends, and her father's deteriorating health and prescription drug addictions are driving her mad. Her mother, a famous poet and author, left minutes after she was born. They reconnected when she was a older, but things have happened since that makes it difficult for them to speak to each other. When the unthinkable happens and Lou's dad ends up in the hospital after a stroke, she is shipped off to live with the mother she hardly knows. Lou decides to make the best of the situation and tries to figure out why her mother left. She is convinced the answer will be found somewhere in her mother's writing, but the conclusion Lou draws is not a happy one. Lou rubbed me the wrong way. The author seemed to be trying to make her optimistic and hopeful, but it just didn't seem to come across the pages right. She had few original ideas and it often seemed like she just didn't get it - any of it. The situation between her and her father seemed extremely unrealistic and I had a hard time relating to them. The strain between Lou and her mother really held the story together for me. With both of them trying to figure their lives and themselves out, they keep missing what really matters most in their relationship. I saw most of the final twist coming, but it was a bit more dramatic than I anticipated. The book ended nicely for me - it left things open to continue in the imagination, but closed enough to give me resolution. This book was touching, and i could realate in many ways. Lou's, father has a heart attack, so she has to go live with her mother who left her as a baby. While she lives with her, she goes to meet her grandmother, who is crazy. She beleived that if she found out what happened between her and her mother, she would find out why her mother doesnt like her. I could totally relate to this story on so many levels. It is a good story for someone who grew up with an absent mother. This story reminds you that you are not alone and gives you a brief view of mental illness. The story of a family where Mom took off, leaving Dad and daughter behind. And how they reconnected, finding out that Mom had major issues with her own mother that she had never tried to heal.